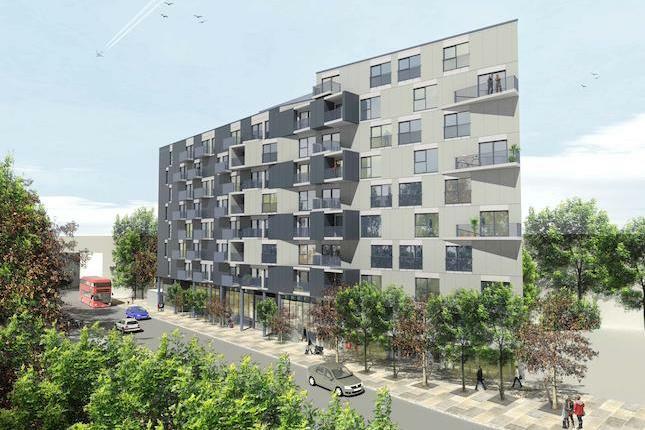 Following on from my recent post looking at the big developments now going up in Lewisham, here is part two. These are generally smaller in scale, with most now under construction. 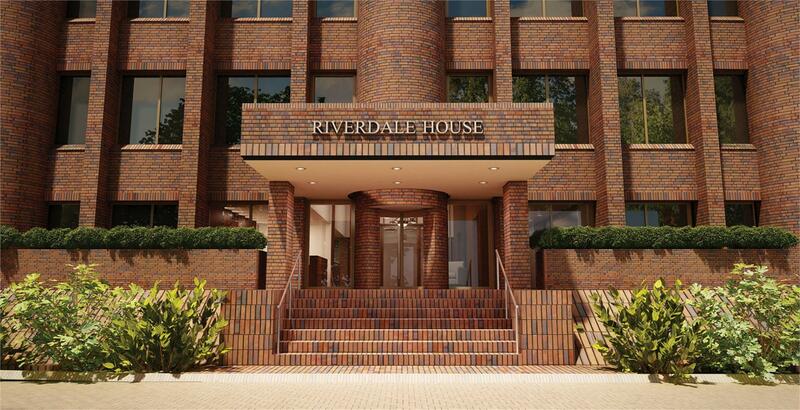 This is Riverdale House from Galliard Homes, which will contain 137 flats. Completion is scheduled to be in Autumn 2015. It is just off Molesworth Street, next to the Ravensbourne river and opposite Lewisham shopping centre. It’s a refurbishment of an interesting office block dating from 1980-81. The plans seem to retain details from that era, such as the same type of brick extending from the main building to the front wall, staircase, and slope from street to wall. It’s good to see these kept. Family Mosaic are behind this development, on an awkward site between two converging rail lines. It appears very budget. 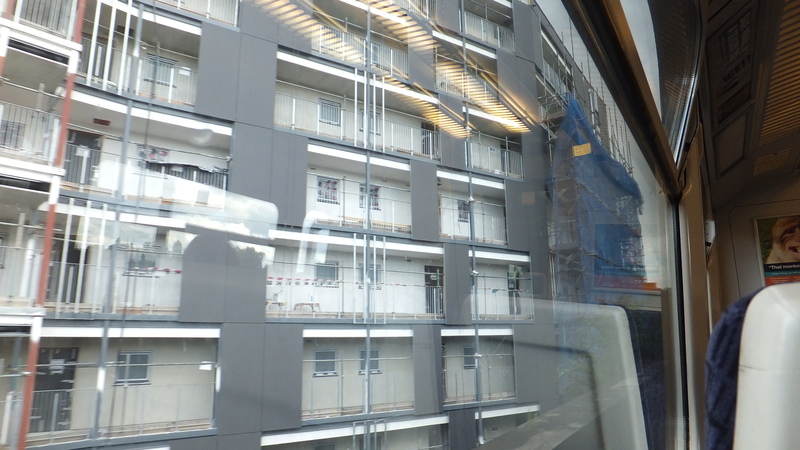 Small square windows and grey panels on walkways, as just about seen above through a train window. Just because it’s facing a rail line doesn’t necessitate such small windows and poor detailing. It doesn’t look too promising at all sadly. There will be 62 units in total. 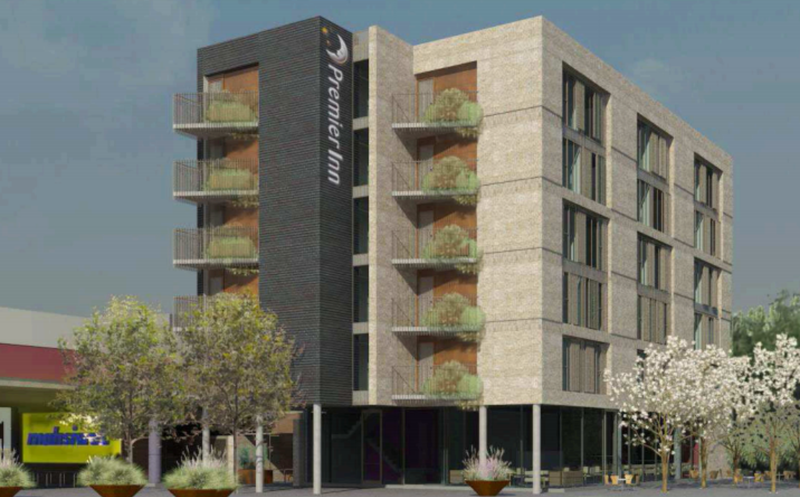 Above left is a render showing the frontage facing Thurston Road. It’s not much better than the rear, and if the quality of materials in evidence on the section facing the railway line are replicated at the front this will be one ugly development. This proposal is directly next to the development above, and opposite Thurston Central. It’s decent for student accommodation (damning with faint praise I know), though the dark brick may appear a bit gloomy and overbearing. The stripes of yellow are intended to relieve this. The proportions are good, and the double height street frontage is welcome. Many have complained of lack of amenities for all the new builds. 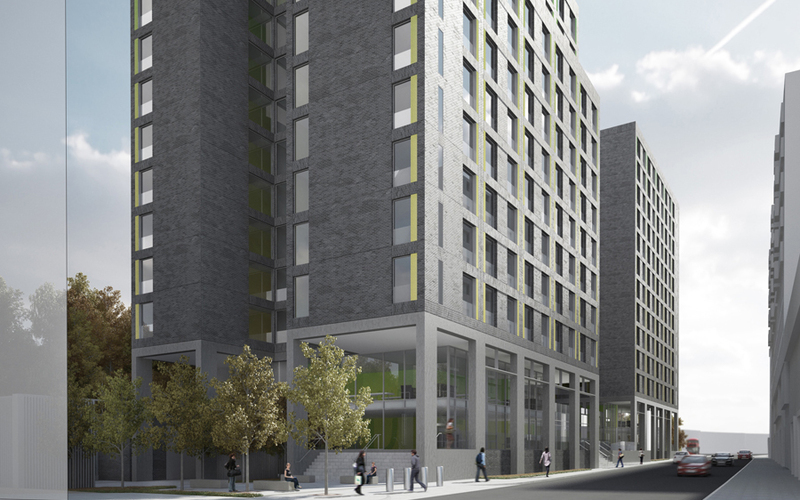 Those ground floor units look like they could accommodate some shops, pubs, bars etc, and with this being student housing it may be easier to get late licenses at the end away from the social housing block and next to the new bus stand. A decent place shouldn’t struggle for custom. 142 student housing units are planned with 410 bed spaces in total. Unlike the others, this has not yet commenced. This is a 60 room hotel located on a small site by the (soon to be removed) roundabout outside the station, and is next to the railway line from Blackheath. It is almost complete. All these new developments close to the station will not only result in more rail capacity needed for additional commuters, but also an eventual rebuilding of Lewisham station. There have been suggestions for many years that rebuilding Lewisham station is needed, but the complexity of the job seems to bring a shudder to Network Rail, both in terms of cost and also the difficulty in carrying out the work. With more and more development around the station, large scale rebuilding is increasinly difficult. Perhaps the proposed Bakerloo line extension from Elephant & Castle will be the trigger to finally get the ball rolling. One possible way to help finance maybe over-site development. Is there scope for a tall development where the DLR’s blue shed roof is? TfL are short of cash and have made noises about over-site developments to gain revenue, either by selling the land or building themselves and then letting out. This is common in many countries but the UK has been slow to adopt it. In the short term an entrance to the north facing Tesco is a must. Currently people entering or exiting the station and heading north are forced on a lengthy detour. There was an exit to the north but this was closed recently under spurious safety reasons. A petition has recently been set up to reopen this gate and provide an easier exit. It would also divide entrants and exits to the station and move some users away from the main entrance. This would lessen congestion, which will become more evident as additional commuters use the main entrance, coming from new developments to the south. No doubt Southeastern do not want to open the gate as they fear losing revenue, which is fair enough. So the obvious solution is to have a staffed entrance and exit with barriers. If they deem that to be too expensive it could be a gate line observed by CCTV. This happens on quite a few London Overground stations since they took over Southern stations. Perhaps this kind of proactive approach will only ever come about if and when TfL take over southeastern’s metro routes. Wow, Thurston Road is one ugly pile! They could not have made it look more like a prison if they’d tried! I think they need to put the brakes on developing in Lewisham for a moment. What schools are all these new residents going to send their children to? What Dr’s surgeries are they going to use, dentists, hospitals etc. Housing is needed but they don’t seem to be building any new facilities to accommodate these people. 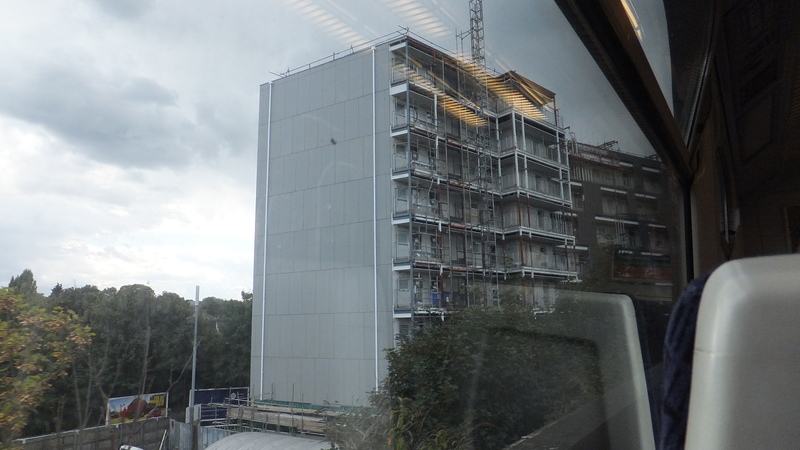 Some of these ugly buildings will be no go areas in 10 years mark my words Lewisham is going to become a ghetto. I love Lewisham but I’m worried it will become over populated. I’m actually moving into the Thurston Road property (shared ownership) and don’t feel it is as bad as you are making out. The Thurston Road side is a lot better than the side you have photographed (for social housing). Inside there is a reasonable amount of space and what looks like fairly decent materials. Good view from the balcony too (a the top). There will also be space for shops on the ground floor of the development.